Surabaya (Soerabaja; 112.750E 7.237S), located on the northeastern coast of Java, was the main port and Dutch naval base in the Netherlands East Indies. It was protected by an impressive battery of 48 coastal guns, but all were of relatively small caliber. Only eight 80mm antiaircraft guns were available for air defense. The facilities included at least one floating dry dock, brought in in 1932. The airfield at Perak (112.732E 7.227S) had two 3000' (914 m) runways and had facilities for both civilian and military users. The seaplane base at Morokrembangan (112.716E 7.226S), completed in July 1925, was one of the finest facilities of its type in the world, with 24 hangars, concrete ramps, underground fuel storage, and extensive repair, maintenance, and communication facilities. However, the harbor was rather shallow and could not accommodate ships larger than heavy cruisers in spite of continuous dredging. The population of the city in 1941 was about 341,700 persons. Oil fields in the area produced about a million barrels a year and there was an important refinery at Wonokromo (112.739E 7.303S) that produced a large amount of the lighter, more valuable fractions, such as gasoline. With the fall of Holland in May 1940, the Dutch relocated all flight training to Java, and the MLD (Marine Luchts Dienst, the Dutch naval air arm) reestablished its flight school at Morokrembangan. The school would be transferred yet again, to Australia, in February 1942. Surabaya was attacked by 72 bombers and 44 fighters on 3 February 1942, and continued to be raided thereafter. 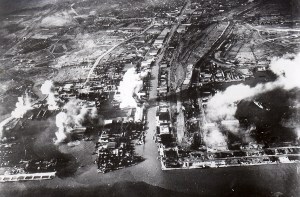 The city fell to the Japanese on 7 March 1942 and remained under Japanese control through the remainder of the war.